This man who's bombarding his way through traffic. 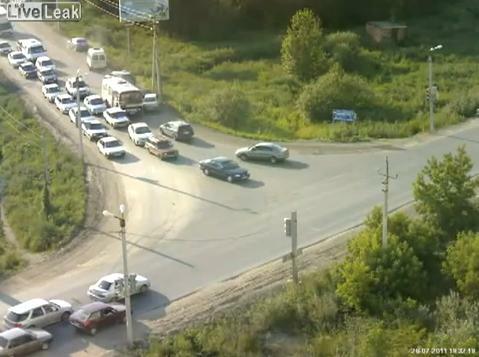 Yes, we're back in Russia again to witness another case of what I like to call, “the idiot behind the wheel”. This time, the accident occurs at a busy crossroad where the bus driver forces his way through three rows of cars (two lanes one way and a single line on the other side), nudging and crashing into everything that's in his path. While we're unsure what happened next, we see people sprinting towards a nearby road, indicating the bus crashed into oncoming traffic. The incident mirrors that of the award-winning film "Speed" that was released in 1994.